Southeastern Massachusetts consists of those portions of Massachusetts that are, by their proximity, economically and culturally linked to Providence, Rhode Island as well as Boston. Despite the location of Cape Cod and the islands to its south, which are the southeasternmost parts of the state, they are not normally grouped in this designation. At its broadest definition, it includes all of Massachusetts south of Boston and southeast of Worcester. As Southeastern Massachusetts is not an official designation, its borders are not exactly defined. Almost certainly, it includes all of Bristol County, Massachusetts, particularly the South Coast along Buzzards Bay, as well as Norfolk County towns on the Rhode Island border such as Bellingham, Plainville, and Wrentham and potentially some towns in Plymouth County. The terms "Southeastern Massachusetts," "Southeastern New England", and "Southern New England" are much-used by Providence-area broadcasters and other local companies and organizations but are not used as frequently in other parts of Massachusetts. For this effort, southeastern [sic] Massachusetts is defined as fifty-two cities and towns from Bristol, Plymouth and Norfolk Counties. The region is geographically defined by Massachusetts Bay, Buzzards Bay, The [sic] Taunton River watershed, and its location relative to Boston, Rhode Island and Cape Cod. Bristol County, Massachusetts and Bristol County, Rhode Island are contiguous and are the only counties in the nation where Portuguese Americans make up the plurality of the population. This is due to the Portuguese-American population, the Portuguese-Brazilian population, and the Portuguese-Cape Verdean population that came to Southern New England in the 19th century to do the much needed whaling work; in fact, New Bedford is called "the Whaling City." ...[it] is home to approximately one million people residing in over 1,300 square miles (3,400 km2). We have been adding 10,000 new residents and consuming 4.7 square miles (12 km2) of undeveloped land each year for the past thirty years, and new transportation improvements (commuter rail, Route 44 and Route 3 & 24 improvements) continue to attract more growth. Southeastern Massachusetts comprises several clearly defined sub-regions, including the South Shore, the South Coast and the Tri-City area around Brockton, Attleboro and Taunton. Despite the diversity within the region, the fifty-two cities and towns all have common concerns and opportunities. 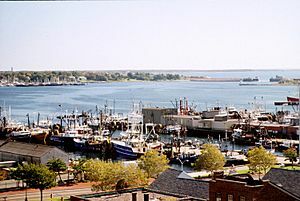 Brockton, New Bedford, Taunton, and Fall River are the largest cities in Southeastern Massachusetts and are close to one another in size. All four have a strong Portuguese and Cape Verdean presence. In 2000, 43.9% of Fall River residents identified as being of Portuguese heritage. This is the highest percentage of Portuguese Americans in the country. Most of the population claims to be of Azorean origin, many from São Miguel Island. There are smaller, but significant presences of other Portuguese-speaking communities, such as other Azorean Islanders, Portuguese from mainland Portugal, Madeirans, Cape Verdeans, Brazilians, and Angolans. In 2000 New Bedford had the second highest percentage of Portuguese Americans with 38.6% of residents reporting that ancestry. New Bedford is also 8.0% Cape Verdean, 4.39% African American and 7.1% Puerto Rican, and 3% were other Hispanics, In 2000 it was 75% White alone. Like most of the state, Southeastern Massachusetts is ethnically and linguistically diverse. However, Portuguese-speakers are especially well represented in this area due to a pattern of immigration that began in the 19th century and was tied to the whaling industry. Today, many people in Southeastern Massachusetts trace their ancestry to mainland Portugal, the Azores and Cape Verde. Quincy, Milton, and Randolph are all in Norfolk County and are included in the Southeastern Massachusetts definition; they are populated by Irish Americans, African Americans and Asian Americans. Irish Americans dominate Norfolk County, Bristol County and Plymouth County which has been known as the "Irish Riviera". Cape Verdean Americans, African Americans, and Irish Americans preside over Brockton, Taunton and New Bedford. Southeastern Massachusetts Facts for Kids. Kiddle Encyclopedia.